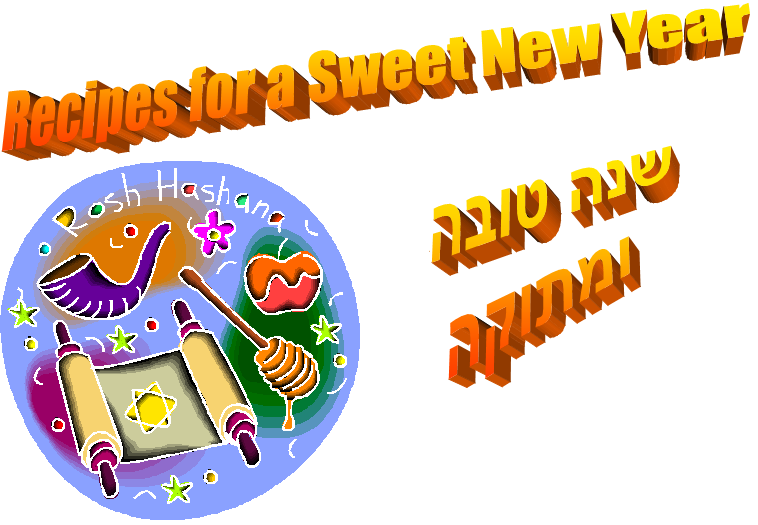 Rebbetzin Rachel's Recipes for a Sweet New Year! The theme of Rosh Hashana cooking is Sweetness – like sweet noodle kugel with fruit cocktail and raisins, sweet tsimmes with prunes and butternut squash along with the sweet potatoes, and of course the sweetest honey cake. How about some unexpected dips for the sweet round challah? Here’s a recipe with a surprisingly sweet twist substituting honey instead of the usual garlic! Mash 2 ripe avocados add a pinch of salt, the juice of one lemon and of course Honey to taste! A bride and groom dip in honey instead of salt for their entire first year of marriage! We start dipping our sweet challah with raisins into honey on the first night of Rosh Hashana, and continue through Simchat Torah, each time symbolically wishing each other and all of Israel a very Sweet New Year filled with love and gratitude. When Moshe woke up on Rosh HaShanah morning he didn’t realize that he had slept so late. For a few minutes he laid in bed thinking about the night before. Who could forget the shining faces and the candles glowing, the table set with all his holiday favorites and the special songs. Moshe began to compare all the holidays to see which one he liked best, but quickly decided that they were all so special, how could he possibly choose. Moshe put his little shofar his parents had bought him that year and his prayer book in his pack and started off. As Moshe came to the forest he forgot all about what his mother had said. He also forgot that just three weeks before his older sister had to go look for him in the forest because he got mixed up and didn’t know which way was home. Moshe was too busy thinking about hearing the shofar and started through the forest. In the meantime, Moshe had been crying for who knows how long. Suddenly he remembered what his father had told him: “In a place where there are no leaders- try to be a leader” (Pirkei Avot 2:6 ). Moshe stood up and wiped his tears. “If I can’t make it to synagogue to hear the shofar, well, I’ll just have to blow it myself!” He took out his little shofar and prayed that God would send the Messiah this year. He took a deep breath and blew the shofar like never before. It was so loud that the sound seemed to travel forever. Far away Rabbi Yitzchak stood up. He had not cried like that in years and felt like a new person. Everyone watched as he took out his shofar, said the blessings and began to blow. The shofar blasts were so loud and pure that everyone in the synagogue trembled. Every person felt as if God was looking right into their heart. Tears poured out of everyone’s eyes as they promised to be a little better than last year. Back in the forest, Moshe had just finished blowing his shofar and he felt about a hundred feet tall. Just then in the distance he heard the sound of people singing. “It must be the synagogue” he said to himself. Moshe ran as fast as he could and sure enough he got there just in time for the blowing of the shofar. His father gave him a big kiss as he ran in to stand next to him. Moshe’s father couldn’t help notice how his little boy was growing up. Far away Rabbi Yitzchak finished saying shana tova, a good year, to the last of the congregation before returning home. As he came into his house his wife and children couldn’t help notice how young and happy he looked. For Moshe and Rabbi Yitzchak it was a very good year indeed. it is renewed in the shofar call. the rest must come from the heavenly dew. Yes! this year will be new. to show us what is really true. Yes! this year we will start anew. to be reborn in the King’s hall. to remind us of preciousness grown. in the palace of the Most High. may our hearts be a shofar call! Of all the mitzvot, rituals and customs of Rosh Hashanah, blowing the shofar stands out as the most potent of all its symbols. The physical action of blowing the shofar entails breathing deeply in and then blowing out. This action is reminiscent of the description of the formation of man in Genesis: “and God blew into his nostrils the soul of life” (Genesis 2:7). It is explained in Kabbalah and Chassidic thought that God blowing into man the soul of life mirrors in an allegorical manner the way a person first gathers air into his lungs from the diaphragm, the deepest recesses of his inside, in order to after words blow out fully. It is thus understood that the soul of man emanates, as it were, from the deepest essence of God. This idea is an essential foundation of Chassidism and is expressed in the teaching that the soul of man is “a portion of God Above” (paraphrased from Job 31:2 as taught in the second chapter of Tanya). When Rosh Hashanah is called in the prayers the “birthday of the world,” it means the creation of the physical universe in general, but more specifically, the anniversary of the creation of man. In this light we can understand the blowing of the shofar on Rosh Hashanah as the remembrance of God blowing into man the soul of life. While the physical action of blowing the shofar is from inside-out, the action most associated with Yom Kippur is just the opposite - from the outside-in. Throughout the night and day of the Yom Kippur fast we continually take our clenched fist and tap our hearts, hoping to arouse repentance and remorse for our actions. The prayers of Rosh Hashanah begin the ten day period of repentance in a general fashion, while the prayers of Yom Kippur hone in on the details. The thoughts, speech and actions of the previous year, all of which began within us and moved outside us to affect the world around us, are all brought back inside, to be reviewed, rectified and atoned for. The holiday of Succot, following the contemplative days of Rosh Hashanah and Yom Kippur are in essence a continuation of the same repentive process, but with a special emphasis on joy and integration. What begins on Rosh Hashanah as ethereal and idealistic longings and promises of the heart must now be actualized and brought into practical reality. Shaking the four species (palm, citron, myrtle and willow) represents the integration of the inside-out action of Rosh Hashanah with the outside-in action of Yom Kippur. This is accomplished by shaking the four species to the six directions of space, by first holding them close to the heart and then shaking outwards, followed by bringing them back to the heart. All the most inner, deep felt prayers of the previous holidays born in the heart and mind must now find practical ways to manifest themselves in the outside world. The in-out, out-in, motion of shaking the four species is a potent symbol of unification and actualizing our goals and hopes for the new year. The integration which takes place during Succot is further represented by circling the synagogue once each day of Succot and then seven times on the seventh and last day of Succot called Hoshanah Rabbah. The holiday cycle, now drawing to a culmination, is symbolized by these seven circuits of the synagogue. Some Chassidim have the beautiful custom of blowing the shofar after each circuit, in order to emphasize the entire process beginning on Rosh HaShanah is now coming to a close. Just as the Jews marched around Jericho seven times and then blew the shofar, causing the walls to come down, this is our chance to break down any last psychological walls still standing between us and God. An element of Yom Kippur is added to Hoshanah Rabbah by those who have the custom to wear their special holiday robe, a kittel, as they did on Yom Kippur. Though we usually think of Neila, the last prayer of Yom Kippur as representing the “closing of the gates” of the ten day period of repentance and atonement, we are taught that the final seal is actually on Hoshanah Rabbah. This is symbolized by hitting five willow branches on the ground five times, reminiscent of the hitting of the heart on Yom Kippur. Additionally, many of the prayers and the way they are chanted during the ten days of repentance are repeated on this day. Hoshanah Rabbah thus takes many of the elements of Rosh HaShanah, Yom Kippur and Succot and weaves them inside-out and outside-in.